I confess, I had a fried chicken craving a month ago and I stopped in a Popeye’s to scratch that itch. I am not above the occasional fast food meal, especially if fried chicken is involved. Deep fat frying is one of the two things in the kitchen I can not master and so I have to go outside the home for my fried chicken needs. 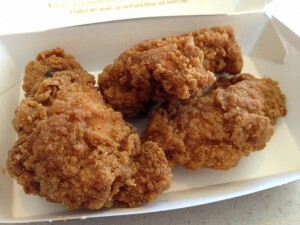 Enter the latest attempt from McDonald’s to lure you in under the golden arches - Mighty Wings. I purchased a 3 piece order ($3); it came with two drumette pieces and one wingette. The ads promise that they are “bold, spicy and delicious,” and I have to admit, I was surprised at the level of heat from the cayenne and chili powder delivered. The chicken was not over fried and the bone does keep it fairly moist. The bad news is that the breading is too thick, almost cardboard-like, and proper breading is critical to the fried chicken experience. So, sorry McDonald’s, you aren’t replacing Popeye’s (or even KFC) for my fried chicken fix.